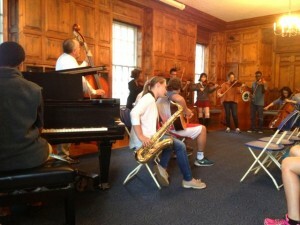 One student ran to grab her saxophone while others picked up their violins and violas and two sat down at the piano. When jazz musician Regina Carter stopped by the Reed Campus Center, she sidestepped the typical lecture format in favor of a workshop that was more like jazz music itself: collaborative, improvisational, and enthralling. 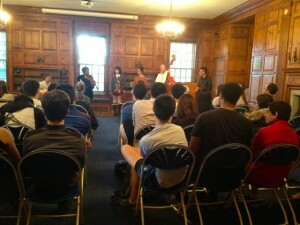 In front of a small audience of students and faculty, she invited the Upper School String and Wind Ensembles to stand up and play with. The group was joined by special guest Chris Brashear, on guitar, and by Fine and Performing Arts Department Head Ben Demerath, on bass. Ms. Carter warmed the group up with a scale—the audience was invited to sing along—and then each of the string players improvised a short solo. Ms. Carter praised them on their abilities and seemed surprised when the players said they had never improvised that way before. One of the best ways to understanding the grammar, culture, and language of different types of music was just to listen and then play by ear, she said. Ms. Carter is a highly regarded soloist who has created collaborations with Faith Evans, Elliot Sharp, and Mary J. Blige, worked with Max Roach, the String Trio of New York, and the Uptown String Quartet, and recently produced her ninth album, Southern Comfort. Her work has ranged from the classically inspired to those shaped by the American songbook and African folk tunes. In 2006, she won a MacArthur Foundation Fellowship. This week, she was in the Pioneer Valley to perform at the University of Massachusetts Amherst. On Wednesday, she told Williston students that music, as a form of beautiful conversation, could transverse any language and any cultural barrier.